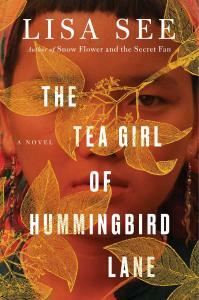 Watch Lisa discuss The Tea Girl of Hummingbird Lane here. Li-yan and her family align their lives around the seasons and the farming of tea. There is ritual and routine, and it has been ever thus for generations. Then one day a jeep appears at the village gate, the first automobile any of them have seen, and a stranger arrives. After mother and daughter have gone their separate ways, Li-yan slowly emerges from the security and insularity of her village to encounter modern life while Haley grows up a privileged and well-loved California girl. Despite Haley's happy home life, she wonders about her origins; and Li-yan longs for her lost daughter. They both search for and find answers in the tea that has shaped their family's destiny for generations. "[Lisa See] creates a complex narrative that ambitiously includes China’s political and economic transformation, little-known cultural history, the intricate challenges of transracial adoption, and an insightful overview of the global implications of specialized teas….As this is her first book since losing her own mother, bestselling author Carolyn See (to whom it is dedicated), See’s focus on the unbreakable bonds between mothers and daughters, by birth and by circumstance, becomes an extraordinary homage to unconditional love." "With vivid and precise details about tea and life in rural China, Li-Yan's gripping journey to find her daughter comes to life." "Engrossing...a riveting exercise in fictional anthropology." "The full sweep of their practices is flawlessly embedded in See's prose...The hardships that confront Li-yan in her life are as compelling as the fog-shrouded secret groves where she and her mother cultivate a special healing tea....A lush tale infused with clear-eyed compassion, this novel will inspire reflection, discussion, and an overwhelming desire to drink rare Chinese tea." "In rendering the complex pain and joy of the mother-daughter bond, Lisa See makes this novel—dedicated to her own mother, author Carolyn See, who died last year—a deeply emotional and satisfying read."